While it might sound a little like a project to build the next NASA space-rocket this is a fairly simple investment approach that Irish investors have access to, so strap yourself in! Before we begin may I outline that the word 'satellite' is one of those words that I really struggle how to spell.....for some reason I keep typing it as 'satelitte'.......so this particular blog might take me a while to get done!! Anyway, here we will take on the task of sharing ideas with you keen investors on the concept of 'core-satellite' investment portfolios, how to approach it, what to watch out for and ultimately outline the pros and cons of this particular approach. Lovely-jubbly. What is a Core-Satellite Portfolio? 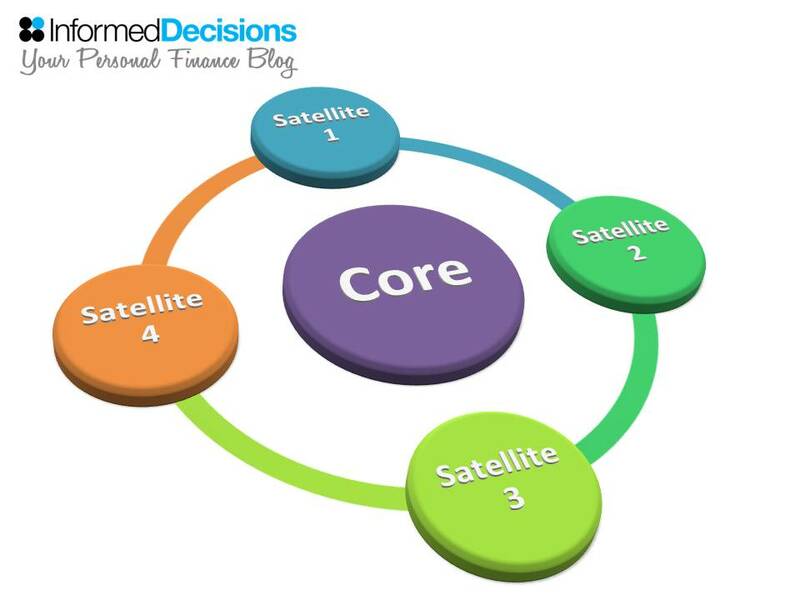 Core-Satellite is not something you might hear often here in Ireland, however elsewhere in the world, such as US & UK, it is a very well established and indeed popular approach to take to investing your funds. Ultimately this approach aims to blend the 'best of both worlds', by combining both Passive and Active strategies into the one portfolio. There has been long term debate over which strategy is best for investors. A recent well documented event was Warren Buffet winning a 10 year, 1-million dollar bet with a hedge fund manager that a passive fund would beat an actively managed hedge-fund over 10 years from 2008. To date the passive fund has delivered over 7% while the hedge fund has delivered just over 2%........it was a land-slide. Yet there are periods where an active fund manager has outperformed passive and indeed been able to reduce volatility levels at certain times and in certain markets. Find out a little more about active strategy in our hugely popular interview with Will Spark here. As a result of this ongoing debate people who are unsure of the long-term best option for them can avail of a 'bit of both' styled approach. That is where core-satellite comes into play, and satisfies that need. How To Build A Core-Satellite Portfolio? A portfolio is just a fancy way of saying, 'a mix of investments/holding'. Its one of these words that sounds nonce, it's straight-forward however! You can create a portfolio with a trusted advisor (our default recommendation!) or you can build one yourself and attempt to manage it over the years directly with an investment firm or online trading. You simply purchase the appropriate funds/holdings and re-balance it each year or so (we'll have an episode on what re-balancing is all about very soon!). Provided you have set up your portfolio (mix of stuff!) in line with your appetite and tolerance for volatility and indeed your long term objective there is no need to ever alter the portfolio. If your long term plan doesn't change then there really is no need to change the mix. In any core-satellite portfolio there will be a certain percentage in Active and a certain percentage in Passive. The core will naturally form the basis of the portfolio, while the satellite represents the add-ons to the core. There are many who would argue that Passive holdings such as Index Funds should form the basis of the core, that historically this offers the greatest return over the long term relative to the risk and volatility. The satellites should be a combination or small selection of managed funds, to offer diversification from the core and a potential to offer growth/stability/selection in preferred investments. Unless you or indeed your trusted advisor are skilled at identifying low cost and high performing Active holdings then it may be a case that having these smaller holdings in your satellites might make some sense. Others would argue that the Core should be more boring and less volatile investments (holdings), where it is risk-managed and relatively steady, in order to try deliver a certain expected long term return. This would offer scope to go for more exciting and volatile satellites to attempt to drive performance upward. This would, or indeed should, lend itself to more predicable returns over the long term, albeit likely to deliver less return than the above example. We've said it before and we'll say it again, begin the construction of your portfolio with the end in mind....what is the objective of it, what are you aiming to achieve, what are you willing to accept in terms of volatility in order to achieve it. The questions, or more-so the answers, should be a large determinant in building and choosing the percentages in each. As a general guideline if an investor is building a core-satellite portfolio typically the core would represent at least 50% of the overall value, the remainder split between one or many satellite holdings. Irrespective of whether it is Active or Passive it always pays to be aware of the costs of the funds, getting access to the Total Expense Ratio (TER) or the Ongoing Charges Figure (OCF). For more on the impact of fees on investment growth go here. In short the pros are that it allows you access to both Passive and Active in a structured manner within a single investment portfolio. It makes it easier to monitor your split between the two strategies and to therefore re-balance it each year to keep it in line with how you initially set it up. Some of the cons one would see are that it can be difficult to keep a clear line of sight on the overall portfolio it if there are many smaller satellites. It can therefore also tempt an investor to make changes to the portfolio selling and buying satellites irrationally, which more often than not will have a negative impact on it's long term performance. If you are interested in a blend of Active and Passive this approach can make a lot of sense. If you are strongly biased toward either then it can also be a sensible approach to still keep an element of the one you less favour, as always it can add another level of diversification to the portfolio and offer growth/risk-management depending on the blend you opt for. If this is new to you you may well now think that Core-Satellite seem like a complex sounding name for a fairly straight-forward approach, and you'd be right, it is! However the clearest benefit from our perspective is that it provides a structure around which to build a sensibly constructed portfolio. Thanks for checking out this episode, and by all means we'd love you to join our growing community of 'informed-decisioners' over here!